Compostable Double Wall Cups can be printed in either full colour or process inks, which are all specialised to be food safe and odourless. 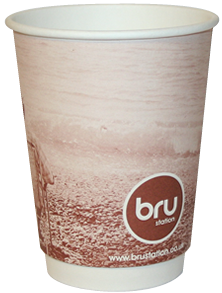 We also use the highest resolution we can to make the images on your personalised paper cup appear professional, flawless and a display of the highest quality that your business can be proud of. These Compostable Double Wall hot cups are available from just 1,000 units, so we can cover you for small runs or large runs depending on your needs. The Double Wall design means two layers of paperboard are used for added insulation. Couple this with the PLA lining, and this gives a completely compostable cup which can simply be disposed of alongside your food waste. All elements of the packaging will naturally breakdown over time. As the majority of paper cups currently end up in landfill, using a Compostable Cup is an environmentally conscious decision. Our Compostable Cup will break down to nothing reducing the amount of plastic which ends up in landfill. Increased speed and cost efficiency: no need for a separate sleeve or double cupping. They provide a more comfortable experience in the customer's hand.